I have the pro version of Simple image gallery pro which was working fine for the past year or so. I went to upload .Jpeg images however it no longer seems to function. Going into the backend of the program it says error and can not upload this type of file which is a jpg file. The rest of my images are all still online and low res images sized at 50-100kb. do I need to resubscribe or something or is there any reason im missing to this error. It could be a permissions issue with your server. What Joomla and SIG Pro versions are you using? Does that shine any light. This is the message I receive after trying to upload a 51kb jpeg file?? First off, check the site permissions. Ask your hosting company to do that or install a tool like Admin Tools. Secondly, re-install the extensions in case files got corrupt. Thirdly, try different JPG, PNG or GIF files. 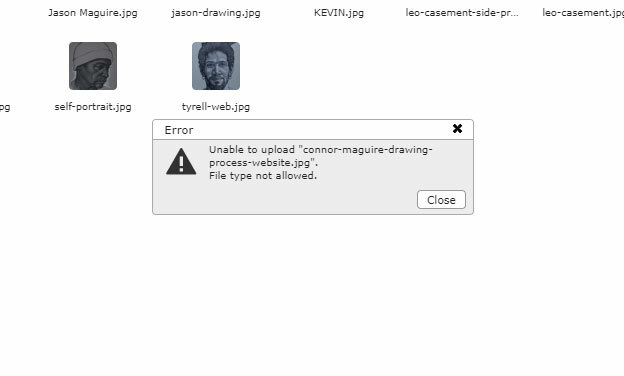 Just started having a similar problem in that I can drag and drop an image into the upload window within a new or existing gallery - the upload window shows as completed (green checkmark) but the image isn't displaying in the gallery. No error messages present, even with Max error reporting enabled. Oddly enough, I can upload the image via the standard Joomla media manager and it works properly ... I go back to viewing the gallery in SIG and the image displays as it should. v3.5.0 of SIG Pro will come with an update for the SIG Pro Media Manager (based on elFinder). There is v3.5.0 Pre-Release 5 available for subscribers and this is actually the last part that remains to be updated so we can ship v3.5.0 final. Last edit: 6 months 2 weeks ago by Fotis. Sounds good, Fotis. I've renewed my subscription and will give the pre-release a try. As a follow-up to my last message, I've installed version 3.5.0 and am now able to upload using the SIGPro media manager, but am still not able to via the 'Add Images' feature within the gallery itself.